Frontier Basement Systems is a member of the Better Business Bureau, Home Builders Association, and various Chambers of Commerce. Our team strives to provide and maintain the highest level of craftsmanship and customer care for our valued customers, so we're proud of our A+ rating with the BBB, as well as our 2016 BBB Torch Award and our Christian County Chamber of Commerce Quality Service Award. We are confident in our team because we train at the corporate headquarters in Connecticut, where many employees have earned the esteemed title "CERTIFIED Waterproofing Professional." That means we are qualified to provide innovative solutions for your home, whether you have water in your basement, radon in your home, want a remodeled basement, home energy services, have crawlspace issues, or structural foundation problems. 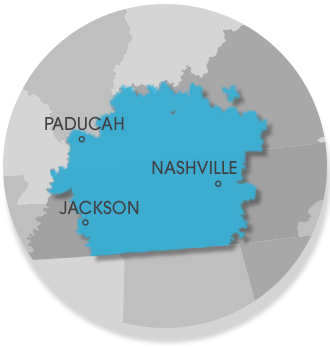 "From the inspector to the workers they were the nicest men..."
"Santos and the crew where very professional in all aspects..."
We have successfully waterproofed or repaired the basements and foundations for thousands of homeowners in Tennessee and Kentucky. If you are located in Clarksville, Nashville, Jackson, or surrounding areas, contact us for a free estimate on basement, foundation, crawl space repair services or insulation at an affordable price. Don't settle for the cheap run of the mill contractor!